Rachel and Jared, two roommates who turned lovahs, got married this weekend and celebrated with a charming backyard wedding in East Austin. The decked out dance hall, hand-built pergolas and Whole Foods catering acted as the perfect backdrop for the tandem bike riding couple who wanted to celebrate intimately with close friends but in classic Austin style. Austin City Limits music festival is back in town, which means we are in for 3 days packed full of tremendous people watching, $5 beers, and sinfully sweet live music performances by our favorite artists. Enjoy photos from day one, which featured performances by Fools Gold, Foster the People (my pick for best Friday performance) and Kanye West. With two days left of the festival to enjoy, a more detailed account of the experience will have to wait until later. Day 2, see ya soon. A Friday night of margaritas and music at Jovita’s. Since we have a big party, er, wedding coming up, I feel now is as good a time as ever to mention some important rules when it comes to getting down on the dance floor. Aww man. Look at that little tot. 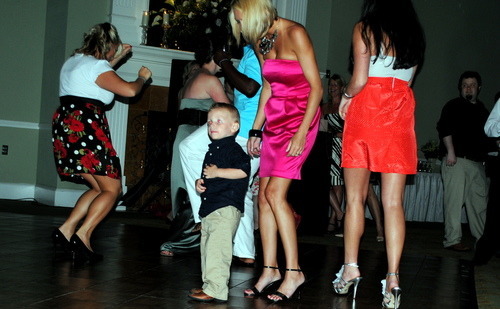 He’s so cute on the dance floor, groovin’ with all the ladies. What an entertaining child he is, and a welcome addition to this dance party! Now, if you will, please observe the difference between that dancing kiddo and the one below. Aww look, this kiddo is dancing too. Wait…she’s not dancing. She’s crawling. Crawling just inches away from the 6 inch, spikey heels of drunk dancing humans! Stop baby, stop! Parents, WHERE ARE YOU?!?! OH THE HUMANITY! Parents who let infants crawl around on the dance floor = bad.